Right now we are 'enjoying' a bit of a hot spell. The days are in the mid to high 30's! I am seriously thinking that air conditioning would be a good thing. We have never used the 'water-cooler', as the temperatures have been nice till now, and it doesn't seem to work that well anyway. This heat is not 'normal' for Guadalajara, but I guess world temperatures are getting to where we don't know what normal is. I would say that since the humidity is only 13%...I won't complain. Beats -30's! There is my little weather rant... ...not quite Rick Mercer! May is the month of holidays in Mexico...they celebrate everybody...Mother's Day, Workers' Day, Teacher's Day, etc. So, on Teachers' Day we celebrated our favourite teacher/coach. 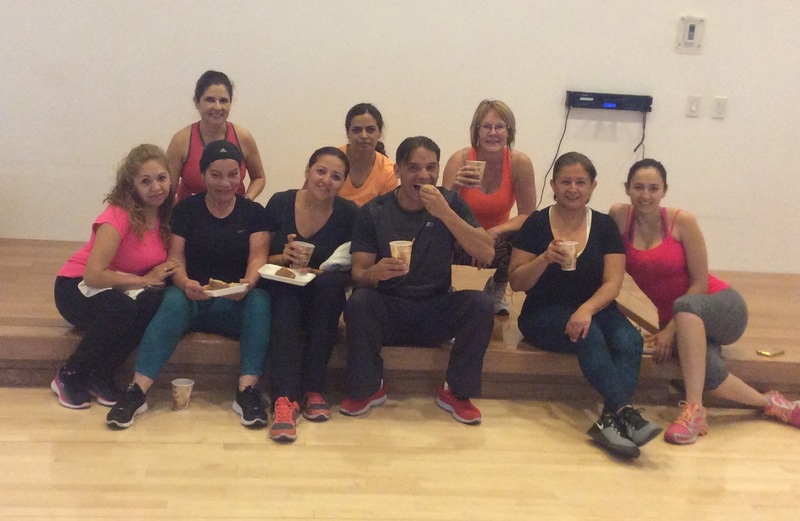 In the middle of us ladies is Nelson Gomez, who teaches muscle toning class, Danzika and DanceStep at the gym. I also did a little baking and gave little cakes to each of my other instructors: my coach who helps me when I go to lift weights, my abdomen coach (insert pain inflictor, as my six pack is lacking) and my other 2 dance class teachers. Ernie and I continue to help out once a month at the day-care for young children. This month, the day we helped, was the day for tears. I seemed to have had a crying child in my arms the whole time. Not my idea of a good time! I told the ladies, as we were leaving, that I did not envy them their day. They smiled and said it wasn't like that often but days like that did happen. Ernie has also helped with the physical needs of the home as well. When we help the less fortunate, others seem to want to join us. So the floor got fixed by an architect friend, the coloured mat was donated by our neighbour (such a blessing), and Ernie spent part of his Saturday doing small repairs together with the husband of the lady who runs things. He also enjoyed talking with the people who run the day-care and leaning that they were believers as well, and that they thought we were. Nice. A 'Godsidence' (Divine serendipity). I am constantly amazed how the world gets smaller and smaller. We have enjoyed repeated contact with our 'family' from Chihuahua. To the right is our 'son' Marcos from Chihuahua. He occasionally comes our for business and gives us a call. Sometimes he stays at our place, sometimes we get tacos together, or, like this time, we headed out for ice cream. We have invited our Chihuahua family to come out for Ernie's 60th birthday in July and many are planning on coming. How nice it that? One thing that I am doing, I believe I have mentioned it, is teaching (use that word VERY lightly) English. Actually it is a conversation class as they have all studied before and just wanted to get better. So we meet every Monday. We pick a theme and I bring some work sheets, some vocabulary words, etc and we practice. One thing I did, mostly in desperation (as 5 people at different levels has been a bit of a challenge), was getting them to talk on the phone with someone. The first time they all called Ernie on my cell and pretended to book a hotel. Then I asked friends from home if they would be willing to talk to my students for 5 minutes each. So Jessy Neufeld and Lori Reimer have both helped so far. I have learned things about my students and my friends from home as they share about their conversation. Anyone else want to join the fun? Let me know. I always tell people that I go to the gym so that I can eat, not so that I can lose weight! True story! I am known to order the same thing for breakfast almost every time. So here is a picture of me venturing out of my comfort zone. Not really, cause it is still 'normal', no weird things like cow stomach, intestines, pig skin, etc. So, as I look at the picture, I wonder if it looks appetizing to someone from home? I can only imagine what my sons would say?!?! What is it? Fried cactus and fried cheese with two fried eggs on top, bathed in a lovely salsa (medium heat). And there were cut up pieces of avocado on top. It was very good. Although I am very partial to chilaquiles! Two of our Bible study groups are close to finishing the study we have been doing. It is a panoramic overview of the whole Bible. We will then look at what we can study next. It is always a joy when they are excited about what they are learning. I am often thankful for the way my faith has taught me the importance of reading the Word of God and for the teaching on it I have received throughout my life. Too often I think we take for granted the exegetical preaching, the emphasis on scripture reading, etc. That kind of focus is more rare in this context than it is in our own. Upcoming events are a 5K run on Sunday for me and on June 11th Ernie and I will join a family from one of our Bible study groups for another one. We will be hosted the youth from our Cuauhtemoc, Chihuahua church in the beginning of July (3-8) as they wanted to experience a missions trip. Then on July 22 we are hosting a big party for Ernie's 60th Birthday. Oh, and somewhere in there Ernie is going deep sea fishing with the gym guys (June 23-25).